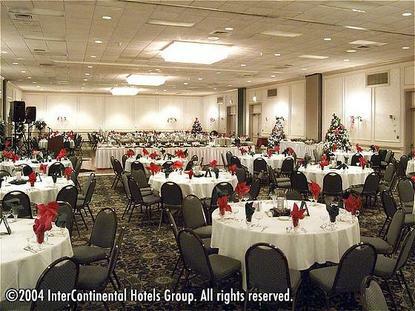 The Holiday Inn Westlake Hotel is a 266 room full service hotel located just off I-90 at exit 156 in a prestigious western suburb of Cleveland. The Holiday Inn Westlake Hotel is just minutes from the newly opened Crocker Park and Lake Erie (Huntington Beach.) We are only 15 minutes from Cleveland attractions: Progressive Field (home of the Cleveland Indians), Cleveland Brown&regs Stadium, The Rock & Roll Hall of Fame, the Science Center, and the Quickens Loan Arena where LeBron James and the Cleveland Cavaliers play all their home games. Special in room amenities are free high-speed Internet, free local calls, and free parking. Businesses: Viking Sewing, Hyland Software, Energizer, Jenne Distributors, Bonnie Bell, KOYO, Shamrock Company, Ford, Henkel, and Rigid Tool. Hospitals: Cleveland Clinic. This hotel is committed to providing accessible facilities under the American Disabilities Act. If your accessibility needs are not met, please contact the Hotel Manager on Duty. Should you require additional information regarding accessible facilities for guests with disabilities, please call 1-800-Holiday (U.S. and Canada) or contact the hotel directly. For the hearing impaired, TDD service is available at 1-800-238-5544 within the U.S. and Canada.